Soundtrack Pro, Apple's exciting sound design software, is the newest member of the Final Cut Pro Studio digital video suite-And whether you're musically impaired or musically gifted, the Soundtrack Pro guide will help you get up to speed quickly. 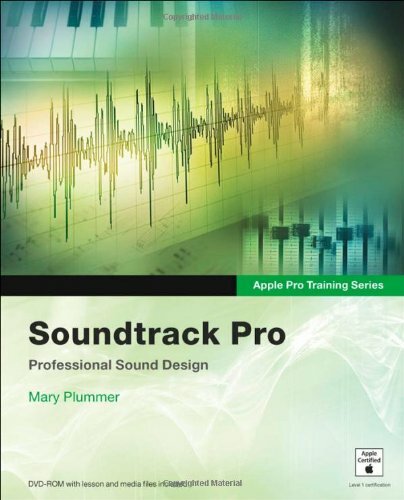 In this Apple-certified book/DVD combo, readers will find a complete, self-paced course in all aspects of Soundtrack Pro. Author Mary Plummer guides you through the secrets of editing, repairing, mixing, and arranging multi-track audio files, as well as how to create original soundtracks, score to video, add effects, and more. Step-by-step exercises and lesson files will have readers taking advantage of Soundtrack's thousands of audio loops to create perfectly synched scores in no time. Also included are dozens of advanced sound editing tips for professional users who want to take their video, DVD, and Web projects to the next level. If you have any questions about this product by Peachpit Press, contact us by completing and submitting the form below. If you are looking for a specif part number, please include it with your message.